In the past few months, I’ve been approached by several clients who were interested in working with me on a “memoir” only to discover—either through conversation with the author or by reading the manuscript—that, in fact, they were looking for someone to edit/assess/develop an autobiography. (Or vice versa.) Memoir and autobiography both involve the author writing his/her personal story, but there are more differences than similarities between these genres. It’s important to give your book the correct label because it will influence audience, purpose, marketing strategy, which publishers will be interested in the manuscript, and more. It seems like a small thing —after all, the label doesn’t change the content of the book—but incorrectly categorizing your manuscript will create a lot of frustration for you when you send it to the wrong agent, try to publish excerpts in the wrong journals or magazines, and give your potential readers false expectations as you build the hype for your forthcoming book on your blog, website, and/or social media. This infographic from PEDIAA sums it up. Both memoir and autobiography are nonfiction works that tell the author’s story from the author’s perspective. However, that’s where the similarities end. Creative writing professors often say that “autobiography is the story of a life and memoir is a story from a life.” (This nugget is based on Judith Barrington’s attempt to clearly distinguish between these genres in her book Writing the Memoir.) In other words, an autobiography encompasses the highlights of the author’s entire life, from childhood to the present; a memoir, on the other hand, focuses on a single era of the author’s life. For instance Angela’s Ashes is a memoir that focuses solely on Frank McCourt’s impoverished childhood in Ireland and Elizabeth Gilbert’s memoir Eat, Pray, Love chronicles her world travels following her divorce. These are stories from a life. By contrast, Bill Clinton’s autobiography, My Life, begins with the former president’s childhood and continues all the way through and beyond his presidency — the story of a life. Another way to think of it is that autobiographies strive for breadth whereas memoirs strive for depth. I suspect that some of the confusion surrounding the is-it-a-memoir-or-is-it-an-autobiography question arises because celebrities and public figures often refer to their autobiography as their “memoirs.” Note the “s” at the end of the word, though. “Memoirs” is a different word than “memoir.” It sounds similar, but as far as literary genres go, “memoir” and “memoirs” are not synonyms, whereas “autobiography” and “memoirs” are very close in meaning. Because a memoir examines a much smaller segment of the writer’s life, it explores that single era in great detail. In other words, a memoir “digs deep” in an attempt to make meaning of the event/era. The author reflects extensively on how the event shaped his or her life, drawing connections between the past event and the present moment; the author also explores the significance of these connections in great detail. Memoir, unlike autobiography, makes a deliberate attempt to draw out the universal elements of a story in order to facilitate readers making an emotional connection to the material. A strong memoir (like a strong novel) can be clearly divided into two main threads: what it’s about and what it’s ABOUT. What it’s “about” is the surface-level story—the plot. What it’s “ABOUT” is the deeper story, which delves into issues that extend beyond the author’s own experiences; readers then relate these deeper issues to their own experiences. Autobiography and memoir also have different purposes. An autobiography’s purpose is to tell the author’s story and disseminate information about his/her life. A memoir’s purpose is to connect with readers on some deeper level, generally an emotional level, by using one’s own narrow experience to draw universal conclusions about the human experience. People read autobiographies because they’re interested in the author. For instance, people read Bill Clinton’s My Life because they are interested in him as a public figure and want to know the details of his personal experience. They want to know about his early life, and they want to know his perspective on the significant public matters he has been involved with. Simply put, people who aren’t interested in Bill Clinton as a public figure won’t read the book. People who want to learn something about themselves and take an emotional journey as they read won’t pull Clinton’s autobiography from the library or bookstore shelf. Memoirs**, on the other hand, are often written by people who are not public figures. Nobody was interested in Elizabeth Gilbert’s spiritual and romantic life before Eat, Pray, Love. Frank McCourt was an anonymous retired teacher living in New York City prior to Angela’s Ashes. People didn’t read these books because they were interested in their authors and wanted to know more about them. People read memoir to gain insight into the human condition and to turn the lens inward, so that they can gain deeper insight into their own experiences. Autobiography, on the other hand, is written in far less detail—it has to be since it needs to cover significantly more ground. Autobiography is more expository, and readers don’t feel as if they’re witnessing the events as they unfold; rather, they feel as if they’re being told about what happened. Additionally, autobiography is written as a straightforward chronological narrative, beginning with birth/childhood and moving ahead in time to the present moment. Both styles can be interesting and fulfilling, and they can both lend themselves to a sense of intimacy with the author. (This is accomplished through the creation of an intimate voice.) That said, these styles do provide vastly different reading experiences, and someone expecting the memoir experience may be disappointed by the autobiography reading experience, and vice versa. 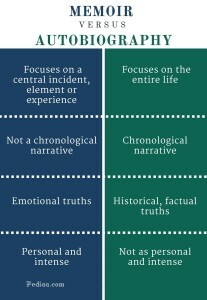 Memoir and autobiography are both common genres. They have a few minor similarities, but they differ wildly in terms of content, purpose, and writing style. It’s important to apply the correct label to your work in order to generate accurate expectations when you’re pitching your book to an agent or publisher, describing your book to a potential reader, or creating marketing materials that target a specific audience. Knowing the differences between the genres can also help you to make a deliberate choice about which one is most suitable for telling your story. If you’re not sure which approach is best for you, or if you’d like some professional help identifying your manuscript as either an autobiography or memoir, I’d love to hear from you. If you’re further along in the writing process and are ready to work with an editor, tell me about your manuscript and I’d be happy to let you know what I can do to assist you in bringing your autobiography or memoir to the next level. ** “Memoirs” is the plural of memoir, but “memoirs” as a synonym for “autobiography” is singular despite the “s” ending. This is probably another reason for the confusion. Working with you on my memoir has been invaluable!